German cuisine has a reputation for offering simply cooked (often roasted) dishes, copious red meat, sausages, and large, sometimes excessively large, portions. While there is some truth in this stereotype - pork and beef are the most popular meats in Germany, there are 1,500 types of sausages in Germany, and Germans do, on average, consume a surprisingly large amount of red meat each year - it should be remembered that this is not the whole truth. There are many interesting German dishes, and each region of the country has its own unique contributions to the culinary arts. Many German dishes are hearty satisfying meals, and even breakfast (German: frühstück) may include meats (such as ham, salted meats such as salami, or meat spreads such as leberwurst), Traditionally, the main meal of the day is lunch (German: mittagessen), but increasingly modern work habits are pushing Germans people towards lighter lunches and eating their main meal with their family for dinner (German: abendessen). Klöße - Dumplings made from potato or dried bread, with milk and egg yolks. This dish is usually known as "knödel" or "knödeln" in Bavaria and Austria. Sauerkraut - Fermented chopped cabbage. Spätzle - The German version of noodles. Spätzle may be used as a side dish with meat, mixed with grated cheese and fried onions and fried or baked ("kässpätzle"), mixed with lentils and frankfurter-style sausages ("linsen, spätzle und saitenwürstle"), mixed with sauerkraut, onions and butter ("krautspätzle"), or used as an ingredient in other dishes, especially stews (for example, "gaisburger marsch"). Eisbein - Braised leg of pork, served with gravy, klöße and sauerkraut. In Berlin, it is cooked with pureed peas. Labskaus (also known as "lapskaus") - A dish made with corned beef, beetroot, onion, potatoes, and herring or ham. The meat is boiled in broth, and then minced with the other ingredients. This mixture is then fried in lard. Labkaus is usually served with rollmops (pickled herring fillets) as a side dish. Saumagen - Pork or beef, carrots and onions, with various spices and flavorings, cooked in a sow's stomach ("saumagen" is German for "sow's stomach"). The result is a dish somewhat similar to the Scottish dish, haggis. The stomach itself is not usually eaten and simply serves as a casing - typically the meal is served with mashed potatoes and sauerkraut as accompaniments. Schwenker - Pork steaks, marinated in onions and spices, and then grilled, traditionally over a wood fire. Hasenpfeffer - A sour stew made from marinated rabbit. The sourness comes from wine or vinegar used in the recipe. Blood sausage (German: blutwurst) - Often made from fatty pork meat, but in the Rhineland, horse meat is traditional. A variant known as "zungenwurst" is a pork blood sausage with chunks of pickled pig's tongue added. Frankfurter sausage - A smoked pork sausage, eaten hot with bread and mustard. While it is undoubtedly the inspiration for the American "frankfurter" sausage eaten in hot dogs, it is not the same. Weißwürste - White sausages made from pork fat. This dish originates in Munich (German: München), and is traditionally eaten in a mid-morning meal known as "second breakfast" (German: Zweites Frühstück). Whether it's crispy fried potatoes, steamed dumplings, or a creamy jelly roll stuffed with raspberries, no one makes food as good as a German grandmother — that is, until now! Featuring eighty-five classic recipes, from soups to Sunday roasts, and desserts to Christmas favorites, Grandma's German Cookbook is loaded with recipes any German grandmother would proudly serve her family. They'll also discover charming profiles of German grandmothers and their takes on classic dishes, for added authentic inspiration. Whip up traditional German meals just like Oma used to make! Gerhild Fulson, founder of the blog Just Like Oma, was born in Germany and learned how to make delicious meals by her mother's side. After years of perfecting her recipes, Gerhild has created this incredible collection that covers well-known dishes from Berlin to Hamburg―and everywhere in between. Recipes like Sauerkraut and Bratwurst, Beef and Onions, Schnitzel with Mushroom Sauce, Lamb Stew, Potato Dumplings and Corned Beef Hash are just a few of the comforting dishes you can make in no time. With easy-to-follow recipes, beautiful photos and helpful tips throughout, you’ll feel like you’re cooking with Oma right by your side. Whether you’re in the mood for the heartwarming dishes of your childhood or you simply want to try tasty dishes from a new cuisine, Gerhild makes it easy for you to take classic German recipes from her family’s table to yours. From Germany to Portugal. From appetizers to Main Courses. Welcome to Authentic European Style Cooking! 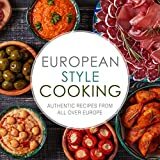 European Style Cooking Part 1 is a collection of authentic European recipes. You will learn an innovative style of cooking that is unmatched and never before seen in a contemporary cookbook. These recipes are unique, they are great tasting, and most of all they are easy. Learn classical European style dishes like: pot pies, seafood soups, pastas, tapas (appetizers from Spain), and much more. German Cooking is a cookbook with over 50 authentic recipes from Germany. You’ll find only the very best and most delicious German recipes. Get ready to discover some magnificent German cuisine. These German recipes are the very best and easiest you will find. You will revisit these wonderful recipes time and again. All these recipes are tried, tested and perfectly adapted for quick and easy home cooking. Scroll up and grab your copy of German Cooking right now! Classical European cooking must include the Germans! Let’s learn the German Style of Cooking. 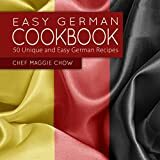 . .
Get your copy of the best and most unique German recipes from Chef Maggie Chow! German classics such as Gurkensalat (Onion and Cucumber Salad), Spaetzle (German Dumplings), and Kaiserschmarren (German Pancakes). Are so easy to prepare you will be amazed at the minimal effort needed to create some authentic German meals. So are you ready to discover authentic German cooking? I hope so. Make sure you have some fresh potatoes, rosemary, and flour on hand. Because they are absolutely necessary! Pick up this cookbook today and get ready to make some interesting and great tasting German meals! Take action NOW! Download this book for a limited time discount of only $4.992.99! Bright flavors. Fresh and healthful. These are not words we typically associate with German cuisine. But this beautifully packaged cookbook is not quite traditional. Featuring 100 recipes for familiar food re-envisioned to reflect the way we eat now, German Cooking Now celebrates fresh vegetables, grains, herbs, and spices as obsessively as it does pork, pretzels, and beer. Chefs Jeremy and Jessica Nolen share recipes from their family table, inspired by their travels in Germany. Slow-braised meats, homemade pickles and preserves, hand-cut noodles, and vegetables every which way—the recipes in German Cooking Now are entirely true to their roots, yet utterly unique. More than 40 full-color photographs and creative recipes for every meal occasion will satisfy food lovers far and wide. Now in a celebratory fiftieth anniversary edition, The German Cookbook is the definitive authority on German cuisine, from delicious soups and entrees to breads, desserts, and the greatest baking specialties in the world. In addition to easy-to-follow recipes, renowned food writer Mimi Sheraton also includes recommendations for restaurants at home and abroad, as well as tips on ordering traditional fare. Historically, German influence on the American diet, from hamburgers and frankfurters to jelly doughnuts and cakes, has been enormous. But, as the author writes in a brand-new Preface, “Americans have begun to realize that Austrian and German cooks have long been adept at preparing foods that are newly fashionable here, whether for reasons of health, seasonality, economy or just pure pleasure.” Many standards foreshadowed the precepts of new cooking, such as pickling, and combining sweet with savory. Alongside old Bavarian favorites, The German Cookbook includes recipes for nose-to-tail pork, wild game, and organ meats; hearty root vegetables and the entire cabbage family; main-course soups and one-pot meals; whole-grain country breads and luscious chocolate confections; and lesser-known dishes worthy of rediscovery, particularly the elegant seafood of Hamburg. Since Mimi Sheraton first began her research more than fifty years ago, she has traveled extensively throughout Germany, returning with one authentic recipe after another to test in her own kitchen. Today, The German Cookbook is a classic in its field, a testament to a lifetime of spectacular meals and gustatory dedication. So Prosit and gut essen: cheers and good eating! The German Cookbook is the latest in Phaidon's bestselling series of authoritative cookbooks on global cuisines.